Bank Nifty has been in a downward trend courtesy falling rupee and tightening measures initiated by RBI. 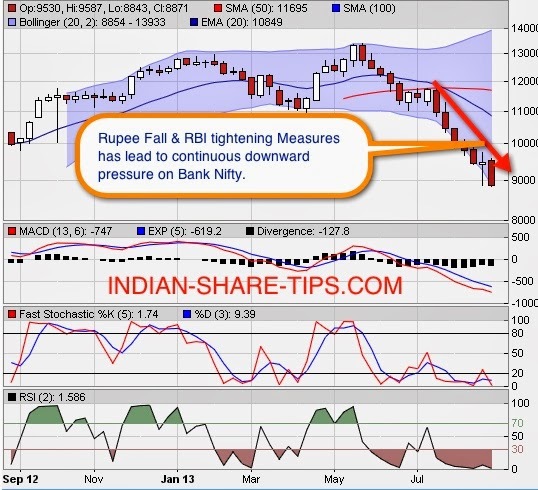 As a strategy keep away from bank Nifty till the time the fall in rupee is not contained by RBI. Markets slump continues as rupee has hit a life-low of 68 per US dollar as investors feared that the country's current account deficit may widen further after Lok Sabha approved $20 billion plan to provide cheap food to poor. You can check live bank nifty chart here and watch it live tick by tick during the course of the day.